Christ in his divinity manhood still retains. " We enjoy the time we spend with family and friends. Sharing stories, breaking bread, laughing, talking, asking questions, watching, listening, loving. Time is precious, we think to ourselves, and we should strive to find ways to use it wisely. To not take for granted that time is always on our side or that we have all the time in the world. Time passes swiftly; how often have we caught ourselves saying "I can't believe it's that time of year again, where did the time go?" Tempus Fugit. At times our conscience may say to us: have I spent enough time with my family? Perhaps a family member has commented, I wish you would come by and visit sometime? Yet do we also ask ourselves: have I spent enough time with the Lord? In the business of our lives, the hubbub, the chaos, the frantic pace, the noise, the distraction, have we remembered that He is waiting for us to visit Him as well? 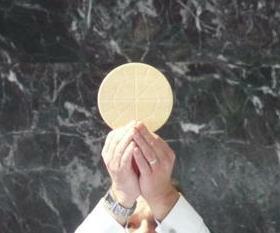 As Catholics, we believe that the Eucharist is the Presence of Christ and is therefore sacred. Eucharistic Adoration is time spent with Christ in the form of the Blessed Sacrament. It is time spent in serenity, in the warmth and love of His presence. It is time for experiencing the quiet and peace of praying before our Lord. Whether the Eucharist is reposed inside the tabernacle or exposed -visible - in the monstrance, adoration allows for placing ourselves in the presence of our Lord, a time set aside to worship either privately or in communion with others. The Real Presence of Christ is there before us and with us always. The Eucharist is a priceless treasure: by not only celebrating it but also by praying before it outside of Mass we are enabled to make contact with the very wellspring of grace. Prayer before the Eucharist can be private in nature, a silent conversation or communing with the Lord. "In peace I will come before you with empty hands, relying solely on your merciful love." (Saint Thérèse's Canticle of Love by Sr. Marie-Thérèse Sokol, OCD.) It can also take the form of praying the Rosary or the Liturgy of the Hours. Where appropriate, this prolonged eucharistic adoration may be accompanied by the reading of some part of the Gospel of Saint John (ch 13-17). Why should Eucharistic Adoration be important to us? It is time set aside with the Lord. A moment in time where we can experience the awesome serenity of God's love for us. A time for experiencing peace in the Real Presence. Indeed, as Jesus charges us, "could you not keep watch for one hour? Watch and pray that you may not undergo the test" (Mark 14: 37-38). Let us as a faith family renew our commitment to Adoration; let us individually and communally spend quiet time with the Lord present in the Blessed Sacrament. Time truly does pass swiftly, and time spent with loved ones is truly a blessing. How much time will we devote solely to our Lord? Bow to Christ the source of grace. Of God's earthly dwelling place. Faith alone may see his face." 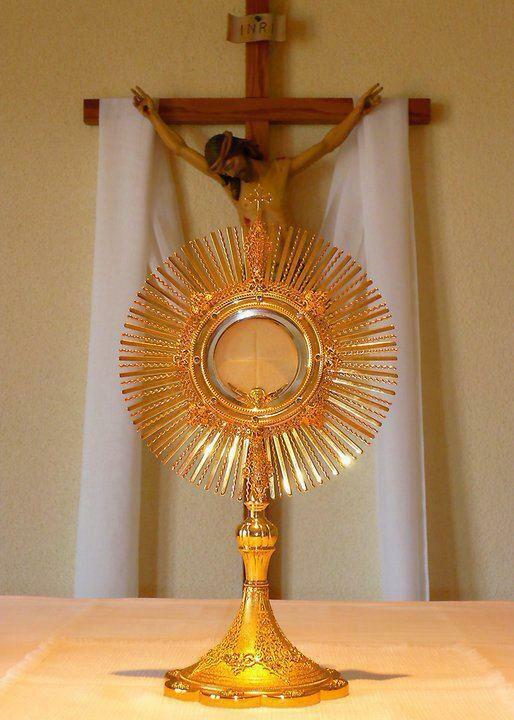 We cannot talk about Catholic prayer life without talking about Eucharistic Adoration. The Eucharist is the Real Presence of Jesus Christ.